There was a time, about two years ago that I was a little obsessed with tropical prints. They were all over the high street and I loved every single piece on offer. I also did go a little mad and bought quite a lot of the same trend. Funnily enough, I’m currently going a little mad over a tropical print dress from Karen Millen, so it’s good to see much hasn’t changed in two years! Well I wanted to do my very first studio shoot in the massive living room of my old apartment and while I generally liked the end result, I somehow felt too self-conscious to post the images. It’s a bit of a pity as they’re quite cool and I love the clothes in them! I have to say the styling I done for this shoot is pretty good! 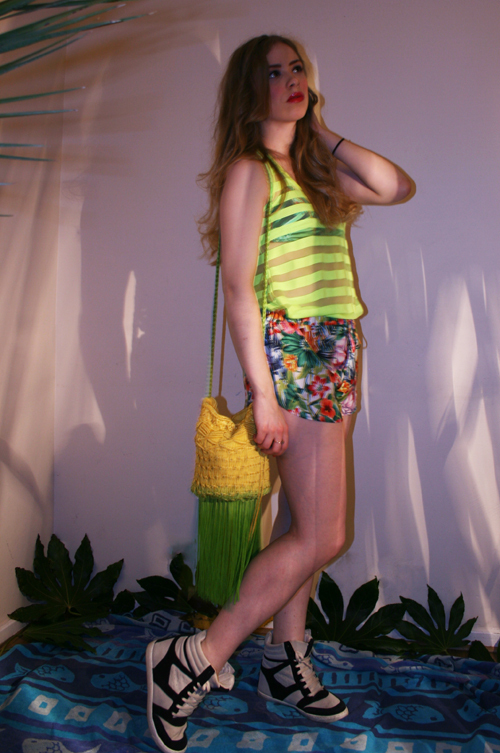 I really went all out with the bright neon colours and clashed it with an array of tropical prints. In saying it, the high street gave me lots of gems to work with, so it wasn’t half as hard as this polka dot trend I’m trying to style right now. This shoot consists of three different looks, but I thought I’d do a look per post, so this is the first of three. I also like the clashing of the neon vest with the tropical shorts and underneath was a very cute Zara bikini top that you can see better in an image further down the post. So what do you guys think of this shoot? It’s a little colouful, a little fun and a whole lot of tropical prints! Let me know as always in the comments section. NICE LOOK!!! LOVE THE SWIMSUIT!!! Same here. Zara don’t do a lot of swimwear, but when they do it’s always fabulous!!! Tropical prints make me really want a tropical vacation haha! It’s starting to depress me quite a bit that it’s not summer yet and I keep looking and posting all these summer pictures!